“Cruising to the Cyclades” is Peter Sommer Travels’ first cruise in Greece in 2018. 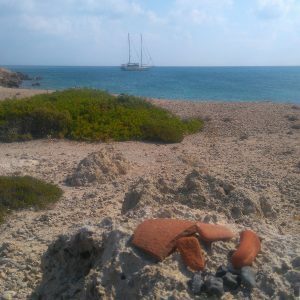 This year, to give an impression of the experience, we are providing a diary of sorts on our blog, following last year’s precedents in Crete and the Dodecanese and this year’s in the Peloponnese. Rather than describing every day in detail (you can check our itineraries on www.petersommer.com for that), every day we will pick one image we took that day, accompanied by some explanations and thoughts. After yesterday’s exploration of the ancient fortification and volcano on Nisyros, we spent the entire morning in the island’s main town (or largest village), Mandraki. There, we saw the Monastery of the Panagia Spiliani (the Virgin of the Cave), set within the remains of the castle of the Knights of St. John, visited the superb little archaeological museum, and took some time to relax and stroll around, before setting out for the nearby islet of Giali in the afternoon. As a general rule, most of our guests have never heard of either Nisyros or of Mandraki before we stay there. Also, as a general rule, they tend to love the place. 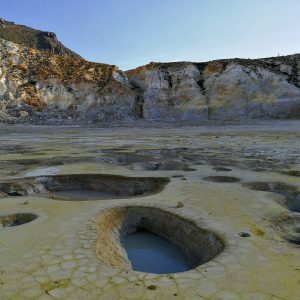 Nisyros is surprisingly beautiful and green and has interesting things to see, and Mandraki is an inordinately attractive place, welcoming and friendly and superbly calm, a place that invites the visitor to sit back and simply enjoy being there. The ancient city of Nisyros was probably located in the very same area as modern Mandraki, but there is nothing to see of it in the town itself. The ancient fortified acropolis sits on a hilltop just to the southwest, its massive walls, made of enormous blocks of lava, standing out stark and black against the sky. The cemeteries of ancient Nisyros were excavated immediately outside Mandraki, providing the local museum with rich and varied finds. A low outcrop protruding northwards into the sea is the location of the medieval castle and the former monastery. It is from there that today’s picture was taken, showing much of Mandraki town. It is not quite clear how old the town is – in all likelihood the coastal settlements of the island were abandoned during the era of instability and danger in the late first millennium AD, only to be reoccupied centuries later. Mandraki is another typical labyrinthine island village, its twisting lanes opening up into a number of small squares. Unusually, the town is long in plan, stretching out along the coast. Its architectural fabric is made up of a series of houses of fairly uniform size. They are usually combinations of simple cubic shapes, set out to follow the natural contours of the terrain, so that virtually no house has a truly rectangular plan and the overall feel is very organic, making the softly curving lanes a pleasure to walk and a joy to behold. Most of the houses at Mandraki are whitewashed, with shutters and doors in the emblematic Greek blue, but also in a variety of other colours. 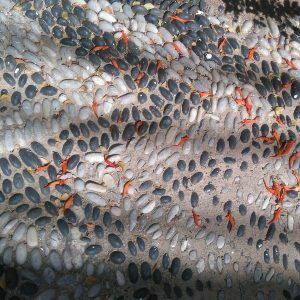 The public squares, as well as innumerable little benches and steps outside private homes, are copiously decorated with chochlakia, the pretty pebble mosaics that are so common in the Dodecanese. Mandraki is not a particularly touristy town, although it has tavernas, a few souvenir shops and galleries, two or three hotels and a few rooms to rent. Most visitors who come to Nisyros are day-trippers from the large beach hotels on nearby Kos, shepherded through the island to see the volcano and have a meal, disappearing in the mid-afternoon just as suddenly as they turn up in the morning. It is easy to avoid these groups and to enjoy a very personal and intimate experience of Mandraki. Strolling around its lanes in the evening, one comes across old ladies sitting on balconies or benches outside their front doors, chatting to one another across the lanes, as they appear to have been doing for centuries. At daytime, the place is an interplay of shady stretches and sun-bathed squares, the latter avoided by the locals until the late afternoon cool-down sets in. The squares are not lifeless, though: during the day they serve as a vast playground for countless kittens… Mandraki is a place to be enjoyed in a relaxed and unhurried way, ambling through its lanes, or sitting by the seafront with a coffee or a drink, listening to the surf lapping against the lava boulders. If you are looking for serenity, come to Mandraki and stay for a little! Now, we are anchored off Giali, enjoying the afternoon sun and taking our time to relax and swim (and write blog posts). Tomorrow will bring us to Kos, rich in archaeology and another highlight of this cruise. 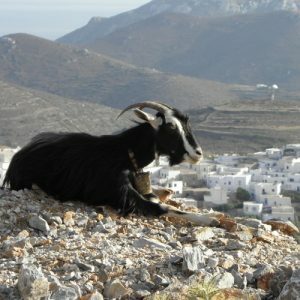 Amorgos Chora, a Cycladic island's "capital village"